Excitement has been mounting around the progress and impact of solar in East Africa. Solar in Africa is perennially a hot topic because it seems to solve two problems at once: reducing greenhouse gas emissions while addressing some of the biggest energy needs on the planet. But do the numbers match the hype? And where are we seeing the most progress? Looking specifically at Kenya's emerging solar market, we see that commercial and industrial (C&I) solar is the leading the way. One way to judge the Kenyan solar revolution would be to measure deployment of residential solar energy products. According to the World Bank, approximately 3 million quality-verified pico-solar products have been sold since 2009. Assuming an average capacity of 10 watts peak, this translates to 30 megawatts of solar capacity. And this a conservative estimate, as it does not include the popular solar home systems, such as those provided by M-Kopa and Off Grid Electric, which can reach capacities of 100 kilowatts peak. However, small residential systems can only ever tell part of the story, as they have limited capacity and don’t require the engineering, infrastructure or financing expertise needed to support large-scale solar deployment. 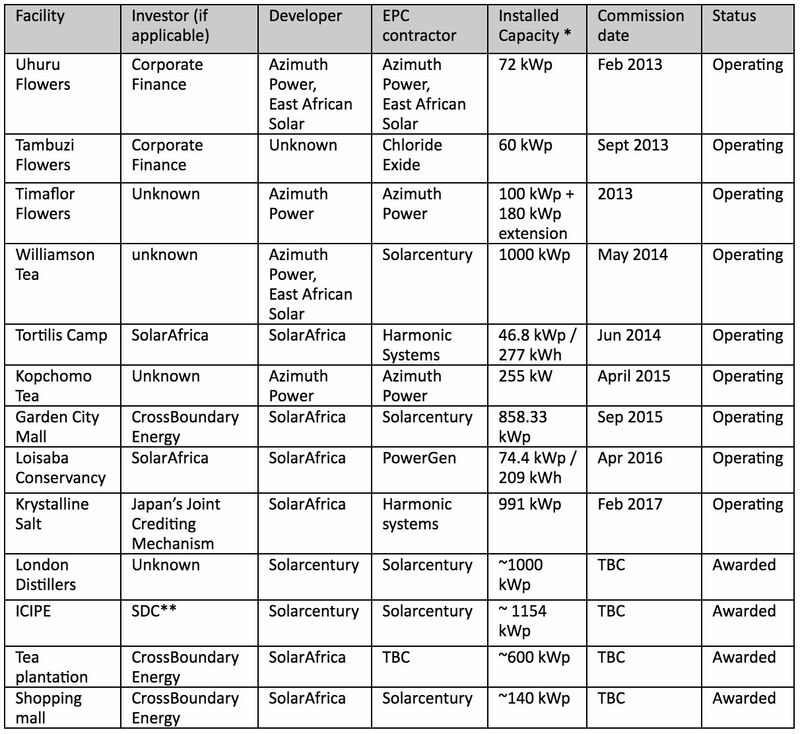 When we consider utility-scale solar, Kenya’s progress seems more disappointing. Of the 2,341 megawatts of national grid-generating capacity, only 0.57 megawatts were solar PV in 2016 -- a meager 0.02 percent. That 0.02 percent solar comes from isolated mini-grid systems installed under the Kenyan Rural Electrification Program. The absence of utility-scale solar projects reflects of a multitude of challenges, including land-acquisition hurdles, securing government guarantees, lengthy negotiation periods and a modest feed-in tariff (FIT) of $0.12 per kilowatt-hour. All of this raises risk and suppresses the potential return developers could realize. The Kenyan government is currently planning to move from FITs to an auction-based system for utility projects. But the timeline for this policy change and the impact on the market are still largely unknown. Meanwhile, solar projects developed for commercial and industrial (C&I) businesses in Kenya seem to have found a sweet spot. System sizes range from 50 kilowatts to several megawatts, and high commercial energy tariffs make the economics of solar broadly attractive. Moreover, direct business-to-business negotiations and the absence of a heavy regulatory burden results in solar projects being installed more rapidly. And because the market lacks the incentives prevalent in European and U.S. markets, such as net metering and renewable energy credits, solar projects are being completed in an environment that is unsubsidized, ensuring competitive prices for commercial and industrial clients -- plus proven scalability of supplier and investor business models. Consequently, the market is attracting a range of investors and financiers to the region hoping to unlock its potential. In such an attractive environment, an estimated 7 megawatts of captive C&I solar have been installed and awarded since 2013, and the growth rate is likely to increase as confidence in the market grows. The table below offers an overview of installed and pipeline projects, but it is by no means an exhaustive list of all systems. Being a largely unregulated market, many smaller systems fly under the radar. This target market represents a large share of Kenyan energy consumers. C&I customers are responsible for approximately 72 percent of energy consumption in Kenya (5,237 gigawatt-hours per year out of a total 7,330 gigawatt-hours) and 68 percent of Kenya Power electricity sales. As such, it represents a huge opportunity for energy providers. With relatively high tariffs of $0.15 per kilowatt-hour combined with demand charges ranging from $2 to $7 per kilovolt-amp, electricity costs are high. In addition to that, many companies rely on expensive diesel generators to provide backup power during the region's frequent power outages. The World Bank 2013 enterprise survey estimates that 57 percent of Kenyan manufacturing firms use a diesel generator to provide 15 percent of their electricity. When compared to the combined costs of high electricity tariffs, substantial demand charges, and significant diesel reliance, the economics of solar looks very attractive. 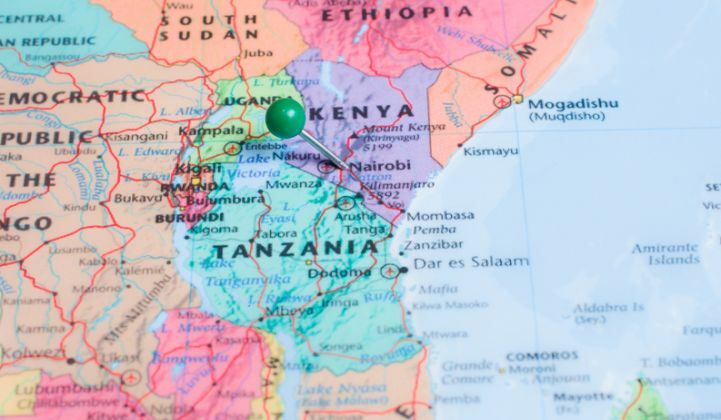 According to Azimuth Power, “Systems typically reduce daytime energy consumption by 50 percent to 70 percent, and a 100-kilowatt system would save upward of 2.3 million Kenyan shillings per year (USD $22,000)." Several innovative players are emerging as key market-makers in the Kenyan C&I space. Azimuth Power is known for its considerable solar engineering experience, and the firm designs, installs and manages its containerized solar PV solutions via a range of financing options. SolarAfrica is partnering with approved EPC contractors and developers to install, operate and manage solar PV systems for C&I offtakers. Financing barriers are also being overcome by CrossBoundary Energy, which has developed the first dedicated investment fund to finance C&I systems in East Africa. Harmonic Systems is a local installer that already has an impressive portfolio of on-grid and off-grid projects across the region. Through their efforts to provide clean and affordable electricity to the C&I sector, these market players and others have an opportunity to prepare the local solar PV market for widespread success, through the development of in-country capacity and market validation. With the project development and financing in place, a successful, well-managed solar project -- C&I or utility-scale -- also needs impeccable installation, accompanied by long-term O&M over its lifetime, typically up to 20 years or more. Thanks to increasing solar demand and the tech-savvy and entrepreneurial spirit of Kenyans, there is a growing pool of local solar installers and technicians. These local partners are essential, as they are familiar with the ports and airports and have regional knowledge of road conditions and weather impacts, which often makes the difference in delivering solar projects on time and keeping them in good repair. Increasingly, local technical teams with access to spare parts, tools and remote monitoring are in demand. The power-purchase agreement (PPA) has been an extremely powerful tool in accessing this market. For C&I customers, access to capital and debt has historically been difficult and expensive. PPAs provide access to cost-competitive alternative energy sources that can help companies improve their bottom line. In this market, PPAs also reduce the PV providers’ incentive to sell customers solar systems that produce too much energy for their needs; the provider of a PPA solar solution is more likely to optimize the system size on the facility’s load, bringing in improved engineering practices and efficient allocation of resources. These investor-backed PPA contracts are also setting the precedent for better market standards. For example, CrossBoundary Energy applies international standards to all its contracts, where provisions such as performance-ratio and uptime guarantees are common. These demands drive improvements in the quality of installed systems and increase performance expectations, contributing to the stability and viability of the market. As in all rapidly growing markets, there are still challenges to overcome. Smaller systems are more difficult to finance, so efforts are being made to standardize system designs and aggregate projects into a portfolio to drive down the associated risk. Currency volatility can cause headaches about whether PPA contracts should be denominated in U.S. dollars or Kenyan shillings and who takes on the currency risk. A prevalent issue for installers and financiers alike is the high cost of, and length of time required for, project sales and pipeline development. But these obstacles should be viewed as opportunities for companies to compete with each other to deliver the best solution to C&I customers. Besides providing direct benefits to Kenyan businesses, development of the C&I solar market should be embraced as a key step in the transition to a mature Kenyan solar market. Diversifying Kenya’s energy mix is of great importance, as over-reliance on hydropower and fossil fuels leaves the nation vulnerable to drought-induced power outages and increasing energy costs from volatile fuel prices. Solar is beginning to play a significant role in providing energy security in Kenya, and it is therefore in the nation’s interest to embrace the budding C&I solar market as the springboard to a clean and reliable energy future in Kenya. Rosina Norton is a data scientist and 2017 fellow at the Clean Energy Leadership Institute. Her focus is on leveraging data and predictive modeling to advance the cleantech sector.